I Have a Bean was started in 2007 as a brain-child of Pete Leonard and a couple of business partners. I chatted with Pete last week and got the scoop (get it?!) on his passion for people, coffee, and God. It’s one of those stories that you just gotta hear. In 2005, Pete took a missions trip to Brazil with his church. While there, Pete visited a coffee plantation where he says he tasted the best coffee he had ever had. Always the coffee-lover, Pete decided to learn to roast his own coffee when he got home using his Weber grill as the roaster. Around the same time, Pete had a relative who had been released from prison. As Pete described him, his relative was brilliant, a mathematician, computer programmer, and captain in the Army. But he had lost his way, gone to prison, served his time. And when he was released, Pete’s relative could not find a job. Anywhere. Pete continued to learn the art of roasting coffee, still using his Weber grill, and got pretty good at it. So good, in fact, that his neighbors were asking him for his coffee. And paying him for it! But Pete kept thinking about his relative, the former prisoner who could not get a job. Through a friend who is now his business partner, Pete was introduced to Koinonia House, a local ministry for ex-prisoners. These men, who have come to faith in Christ while in prison, are allowed to live at Koinonia House for 18 months, be discipled in their faith, and then need to find gainful employment. But Pete knew that gainful employment is hard to come by if you’ve got a prison record. And this is where two worlds collide. Pete’s experience with and compassion for his relative and his love for coffee became a business that is also a ministry. I Have a Bean is a micro-roasting coffee company that employs former prisoners with the idea that they can gain some work experience and some solid references so that they can make their way back into the working world. It's a great concept, and it's working. Pete has a dream to expand his micro-roasting operations all across the country, still employing former prisoners. He realizes that there are ex-inmates all over the country who are struggling to prove themselves, and Pete would love to give them the opportunity. Let me tell you, this coffee is amazing. The concept is to keep the roasting plant small enough to ship coffee the same day it’s roasted. That’s some fresh coffee! Pete explained to me that once it’s roasted, coffee is considered fresh for only 21 days. Once it’s ground, it’s only fresh for about 4 hours. The great thing about I Have a Bean coffee is that it’s sold BEFORE it’s roasted, which means that once they have your order, they roast it and ship it on the same day. I could go on and on about I Have a Bean—the concept, the ministry, THE COFFEE!—but you can read more about it on their website. Which is also where you can order their coffee. Which you should do. But first, you have GOT to enter today’s giveaway. Because I Have a Bean has offered not one, not two, but FIVE lucky winners a pound of coffee. FRESH coffee! All you have to do is leave me a comment. Anything. Tell me what you're doing for Christmas. Tell me what you had for dinner. I don't care. Just leave a comment. You can get additional entries by . . .
. . . announcing this giveaway on Facebook.
. . . Tweeting this giveaway to your pals.
. . . following me. So there. 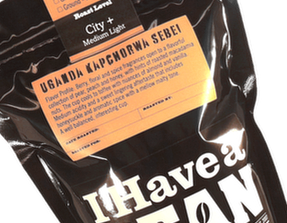 Four chances to win one of five pounds of freshly roasted coffee from I Have a Bean (please make sure to leave me an email address or a way to contact you if you win). I'll leave the giveaway open until Sunday night. Winners will be announced on Monday. Edited to add: I was writing this late last night and totally forgot to tell you something. Pete has graciously offered ALL of my readers a 10% discount on their purchase from I Have a Bean. Simply use this coupon code for your order: WS1-4724. I hope you'll give it a try. I knew about the place but not how he started it or that the coffee was so fresh. Thanks for sharing this! We may have to try some. Is this what you get? You always have awesome coffee. Hi Shelly - LOVE reading your blog!! :o) Always makes me smile! I've seen this coffee being sold at the Wheaton French Markets...and have tasted it (YUM!! ), but didn't know the story behind how it got started. Thanks for sharing!!! I love the intentionality of this kind of ministry/coffee. We have friends in Seattle who do a similiar thing . . . training street kids in faith and how to be a barista. Cool find, Shelly. Shelley, Thanks once again for another inspirational story! I hope someone will be serving this wonderful coffee at our Christmas table! I had heard bits of this story, but not the whole thing. It's very inspiring. I wish I had some of that coffee this morning...really need it! With 3 kids under 4, Carolyn and I think of coffee as our primary food group, so we're always looking for the good stuff. This is very cool. good idea, good cause, good name... its all good! We'll spread the word as well. I just finished my first bag of I Have a Bean Coffee. I can never remember the exact name of it, so I call it "Sinatra Mandolins" ... it is Sumatra something or other, and mmmm is it good! Thrilled to have a local, globally minded, social-justice roaster right here in Wheaton! Oh, and if I can't win because I'm too far away, that's totally fine. I'm happy just to say hi. As I perused the website - I found an espresso I want to try. Kevin is getting an espresso maker for Christmas so I've got to order some (or wait to see if I won). Thanks for posting. Very inspirational story. Added to my FB page, too. What a great story, Shelly! I'll enter because my mom loves coffee, and roasts her own. She is serious about it, though we don't drink it! (I'm sure I have failed my sweet Southern mom in so many ways - cooking, gardening, sewing, coffee, to name a few! :-) ) Thanks, Shelly, and Merry Christmas! Since I'm late, I'll just have to pretend I can smell the coffee. What am I doing for Christmas?... besides the added stress of my firm's move to a new office during the week between Christmas and New Year? !...For gifts to some of my clients, I decided to "buy local" at two new favorite gourmet places in Wheaton with unusual products: Coffee from I Have a Bean (which you mentioned) and flavored oils/vinegars from The Bleu Olive, www.thebleuolive.com. That way I can promote our local small business and bring some tax dollars back to my community! Great story! Had heard a little before but appreciate "the rest of the story." This is terrific! My husband is always wanting to try new coffees!